This weekend I've been painting Battlefleet Gothic again. The focus this time was on Fleet Auxilia and local defenses. 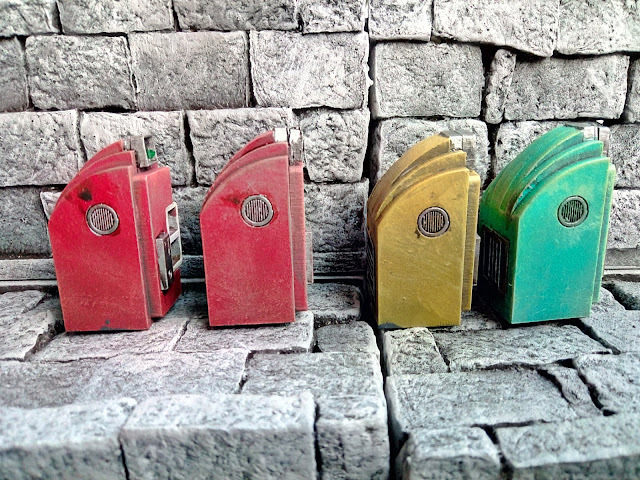 I painted a set of Defense monitors* and my remaining defense platforms. In addition, I painted a recommissioned old Light Cruiser with either a heavy bombardment cannon or an unconventional pattern Nova Cannon** and a Promethium Refinery and bulk transporter***. 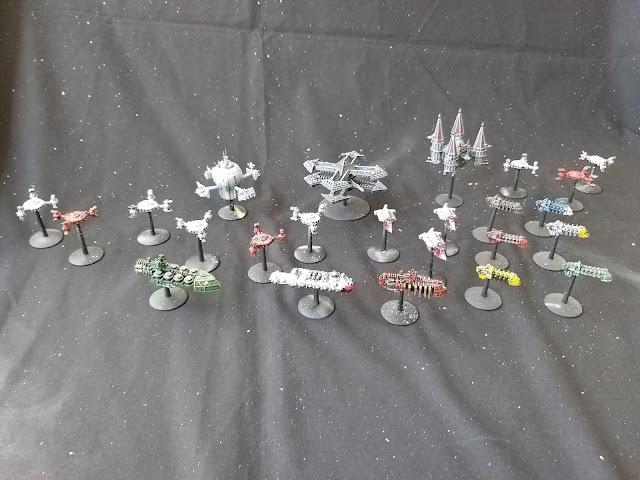 To this I still have to add a quartet of system ships (small intra-system vessels, mostly civilian) and more transports, some of which will be armed transports or Q-ships. 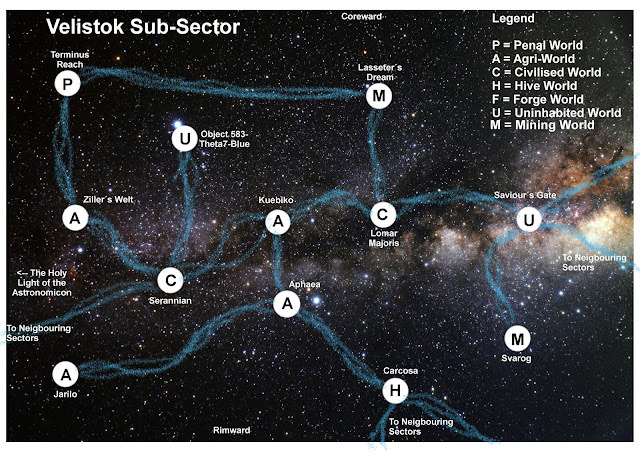 *:Heavy escorts without warp capability, used for planetary and system patrol and defense. Still working on the Hellgate London project, but I felt like switching things up a bit. Especially as we still have a BFG Campaign planned. This is London calling. And a shout out to a wonderful man with a wonderful project. Thursday last week, Devil May Cry 5 released (no, I will not be wargaming DMC...) and a few of my favorite streamers started playing it. The game is about fighting Devils in a ruined, London-esque metropolis. Which triggered memories of an old favorite... Hellgate London! Not the best of games, but an excellent setting to explore. 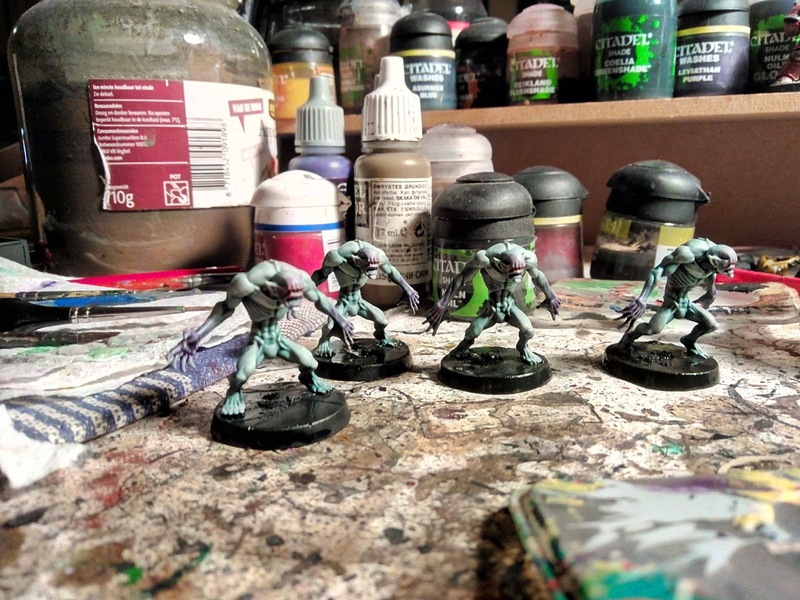 Friday a week ago, me and some friends had a hobby evening. 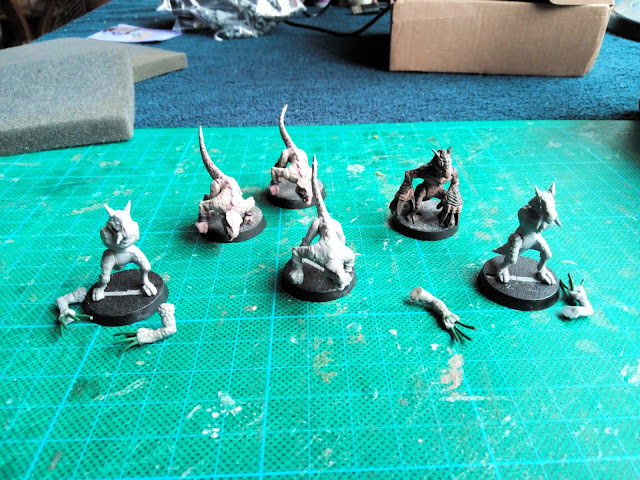 Inspired by the DMC 5 footage I decided to build some extra Hellgate London demons to add to the few I had already converted a few years ago. This Saturday, the airbrush was employed for primer and basecoat (and as I was at it, a second project also got some paint sprayed on). As an added bonus, yesterday my sister came over (she builds 1/12th scale dollhouse style rooms, I guess it runs in the family!) to help me get over my nervousness about soldering LED circuits. Now, I also mentioned a shout out to a deserving man with a wonderful project. 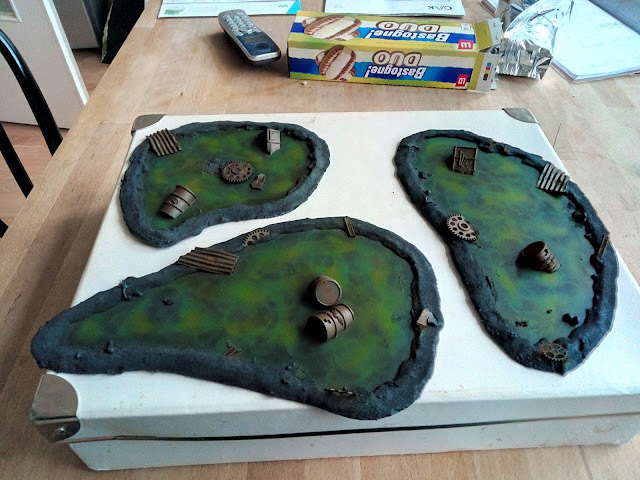 The man in question is Mel Bose a deeply likeable man with a very informative Youtube Channel about building wargaming terrain. What makes him especially interesting is that he regularly collaborates with artists from other disciplines to exchange techniques and knowledge. Why mention him now? Well, he has a Kickstarter to publish a book collecting all his accumulated know-how in physical format. While I have seen most of his videos (and I advise you to watch them too, if you have an interest in terrainbuilding!) I am somewhat fond of terrain-building books, and I know his is guaranteed to be a good one! Oh, hey, I went another month without an update... Sorry about that. 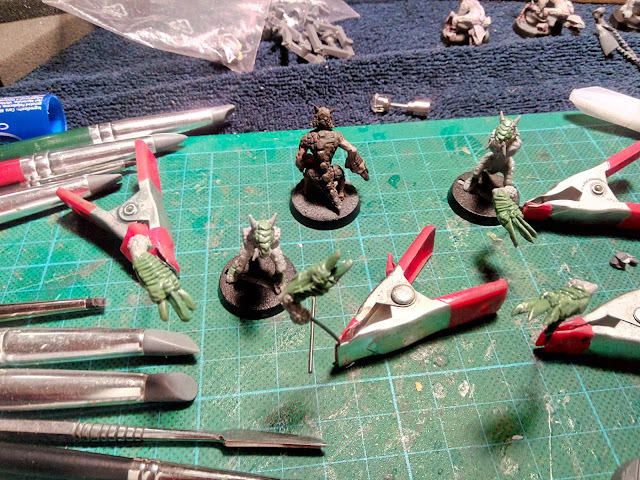 I have been doing hobby stuff, just not as much as I'd like. Focus has still been all over the place, sadly I don't see that changing anytime soon. 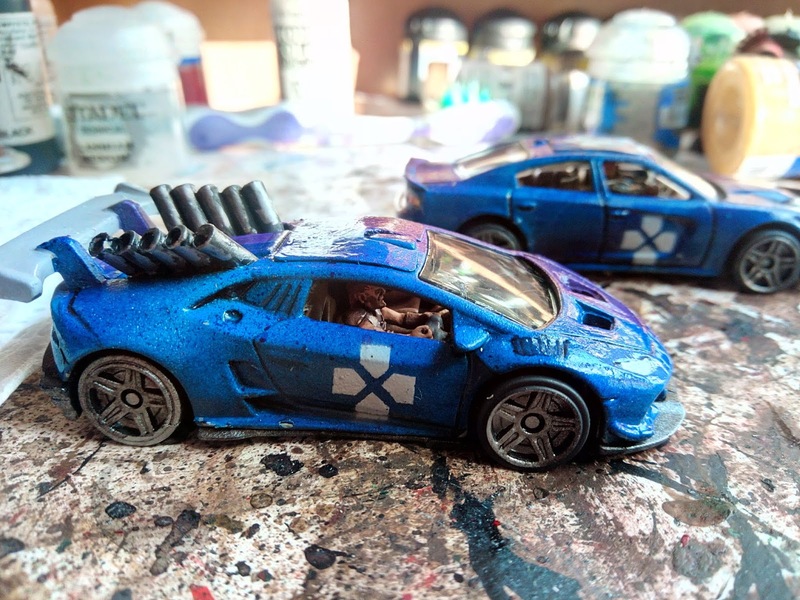 I've been meaning to press on with my Multiverse Gaming Terrain and painting for Blackstone Fortress, but the drive just isn't there. 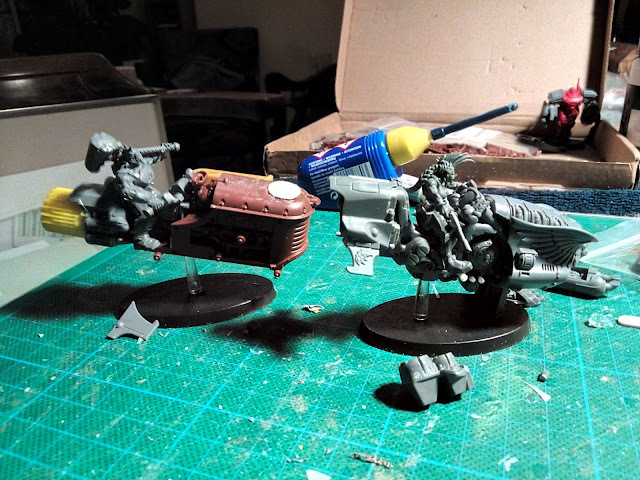 Instead, I converted two Jetbikes for...reasons. 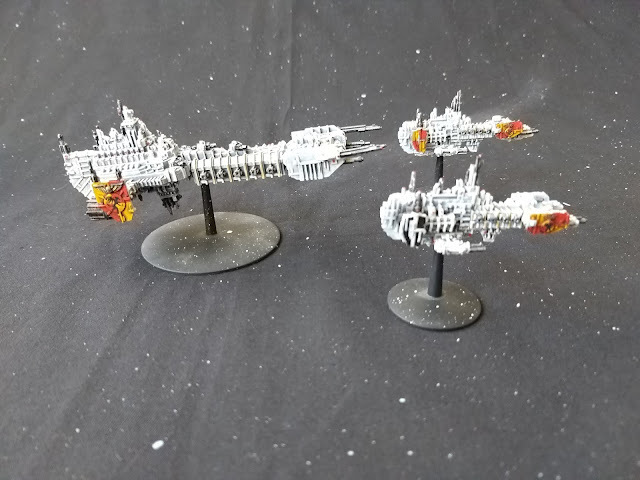 Built a converted Ambot-alike and done some painting on my BFG Fleet Auxilia (Defense Platforms, System Ships and Defense monitors). I've also converted a drifting wreck and made a sector map for our BFG Campaign later this year. 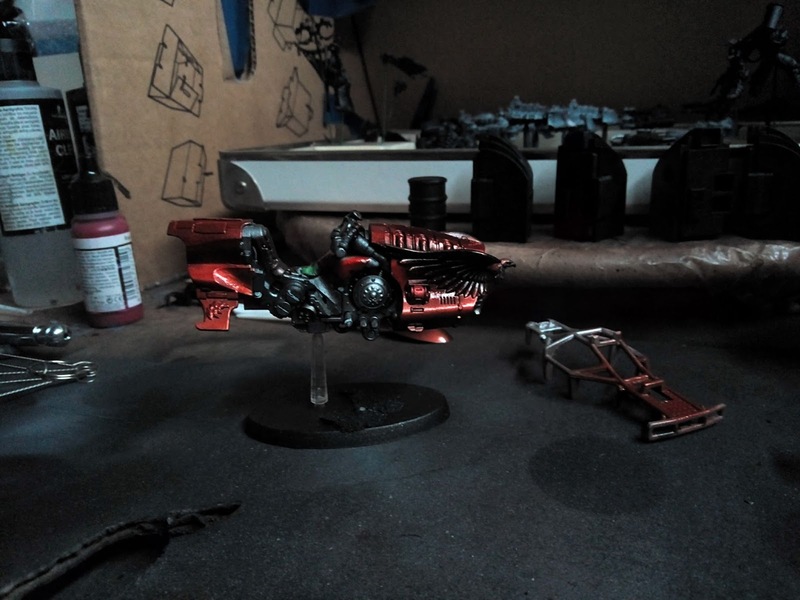 And I tried my hand at a candy colour paint on one of the jetbikes. 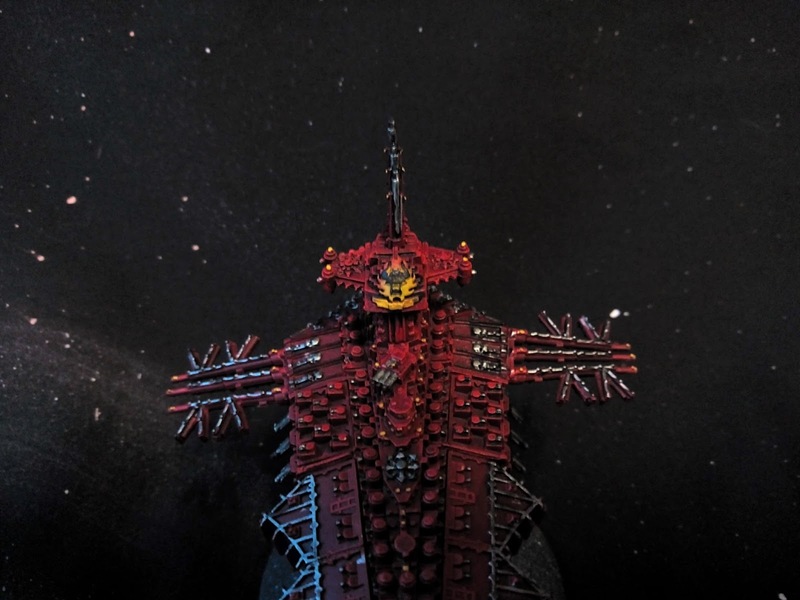 Or rather Battlefleet Gothic Armada II. And my enduring love for BFG combined with the stockpile I still have for it. 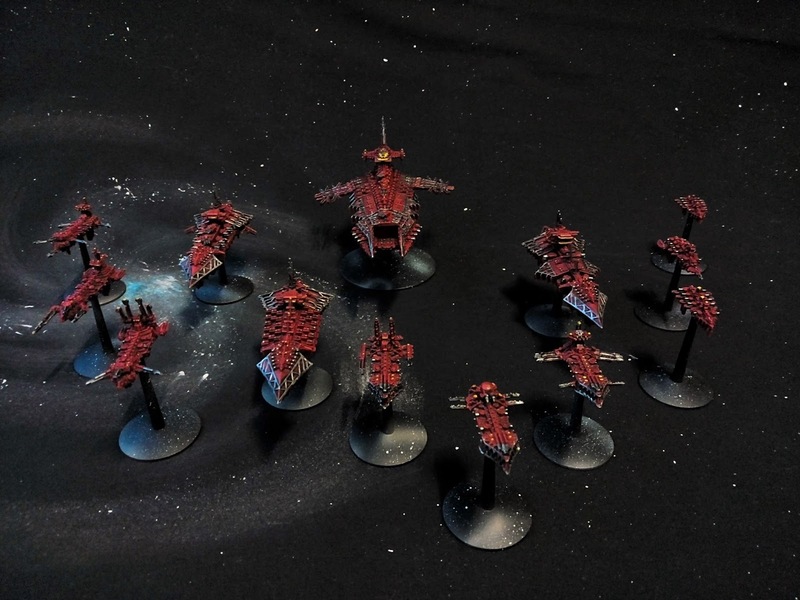 So last weekend, I took advantage of my airbrush and quickly cranked out my Chaos Fleet. I had these stood around assembled for a while now, so it was a matter of priming, then shading/basecoating, followed by drybrushing final highlights and detail painting. The painting was very quick: primer black, preshade with Vallejo Air Golden Yellow, basecoat (lightly) with Vallejo Air Red Gore, then a topside highlight with Vallejo Air Scarlet. 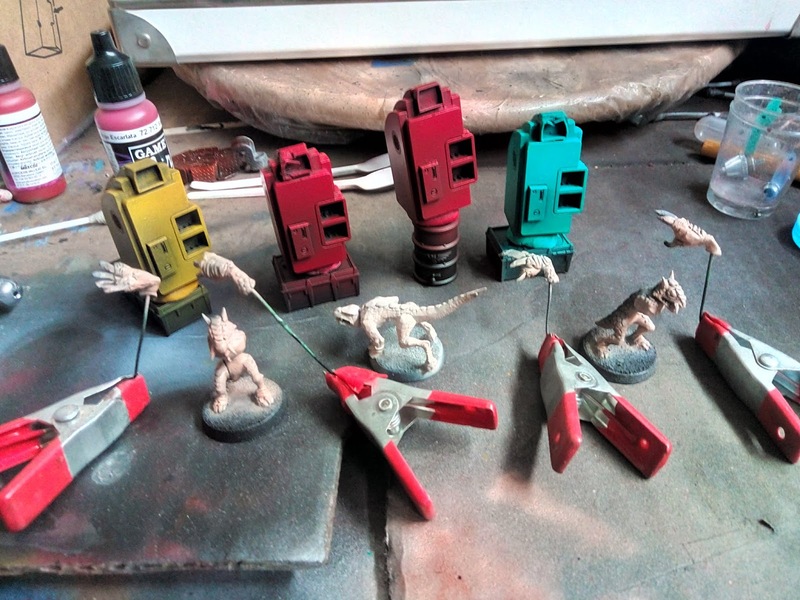 Then on to brush painting: drybrush with regular Vallejo Scarlet, followed by Vallejo Bloody Red. 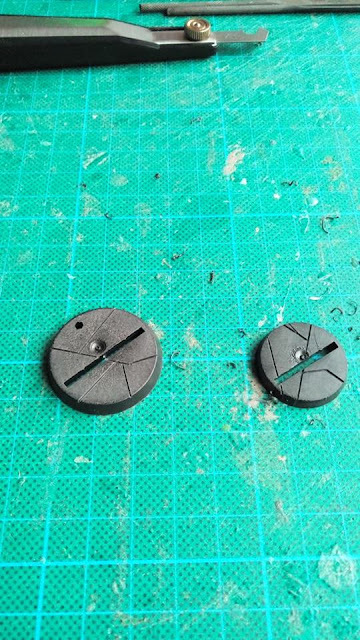 Paint all the bits that need to be metal black, then GW Ironbreaker. Wash the metal parts with GW Nuln Oil Gloss. Paint bridge windows and navigation lights with Vallejo Golden Yellow, as well as the occasional dotted in windows. With the points added for a Chaos Lord and maybe a reroll this comes out at 1500 points. 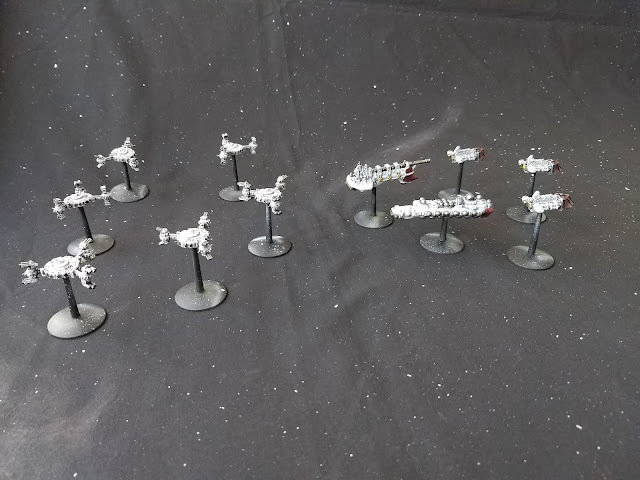 If I can find extra models, I may expand it in the future, perhaps some extra escorts and a Grand Cruiser, if available. 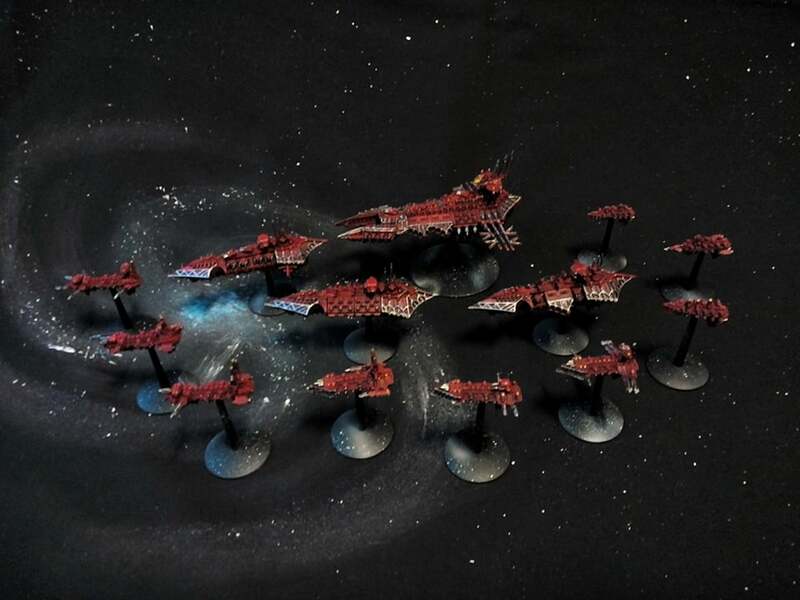 As you can see, this fleet serves the Word Bearers Legion. 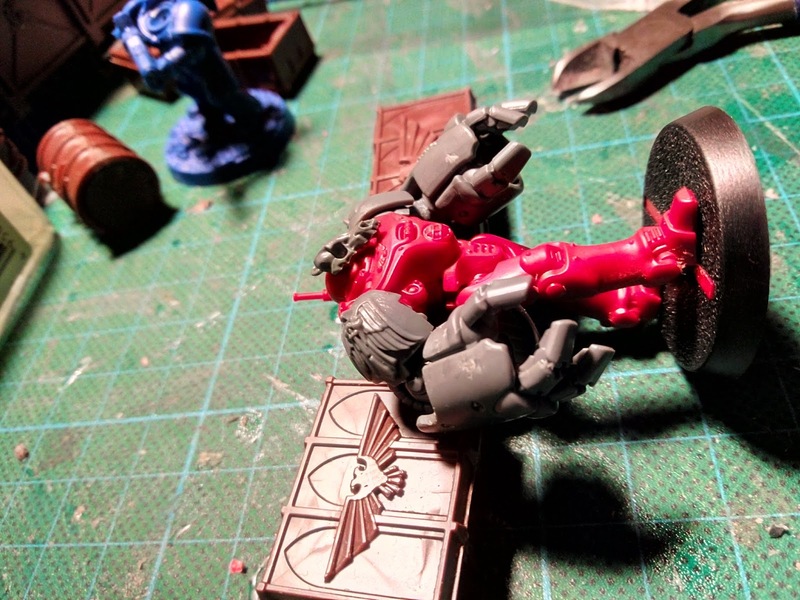 (the icon is a 3d printed shoulder pad icon from shapeways, glued onto the bridge. With regards to the social part of the hobby my (ir)regular gaming buddies and I are discussing starting up a BFG campaign. As several have interest in an Ork fleet, but no ships, we're holding a scratchbuilding day in a few weeks time. 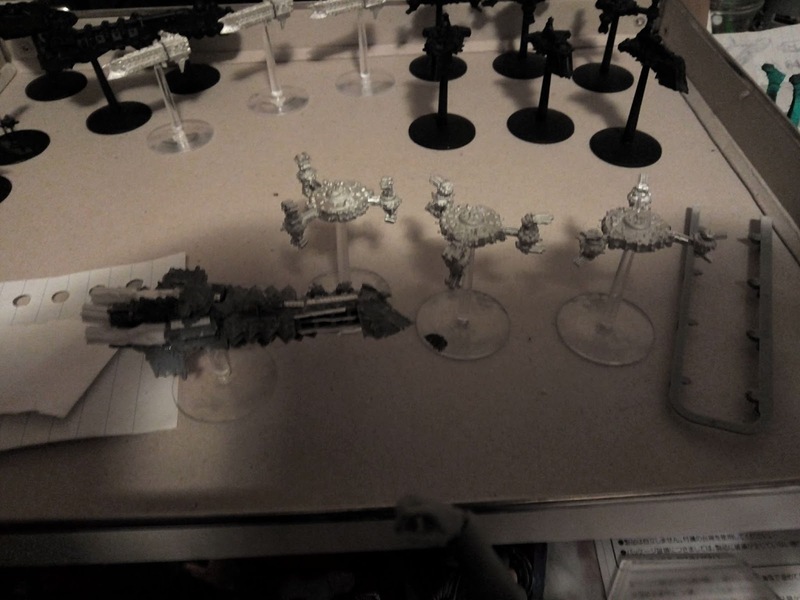 I plan to take along my unassembled Ork ships, partly to assemble and partly for size reference. 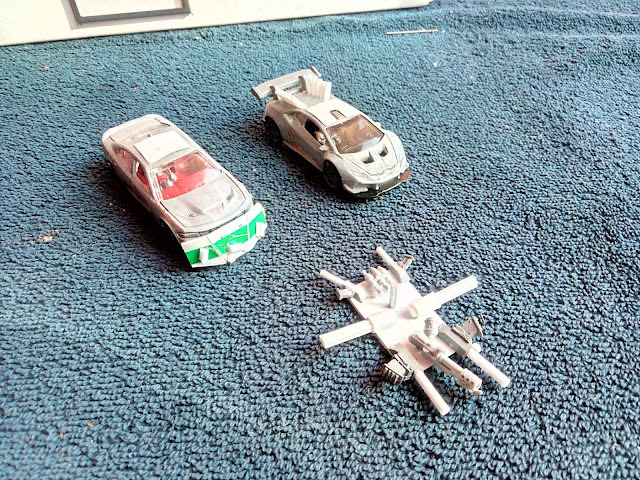 I'll also be bringing a handful of spare bits for them to use and for me to try and build a few drifting/burning wrecks out of. I'm also resisting to start spending on BFG again, I feel a powerful craving to order sets of 3D ordnance and Voss/Armageddon style prows, but I have enough stockpile of BFG I feel I should attend to first. 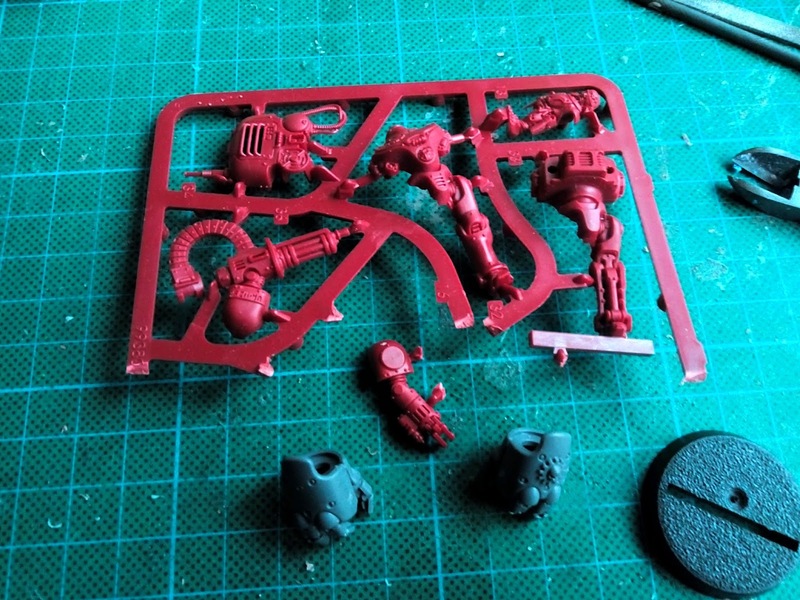 Sadly the resin didn't behave exactly the way I had hoped it would. It lifted a bit from the edges in places, leaving a visible 1mm gap between the resin and the edge of the pool. The surface also remained tacky. I tried to solve the latter with gloss varnish, but it dried up too matt and killed the depth effect. I don't want to trash these pieces as they look too cool, but I'm still pondering how to fix it. 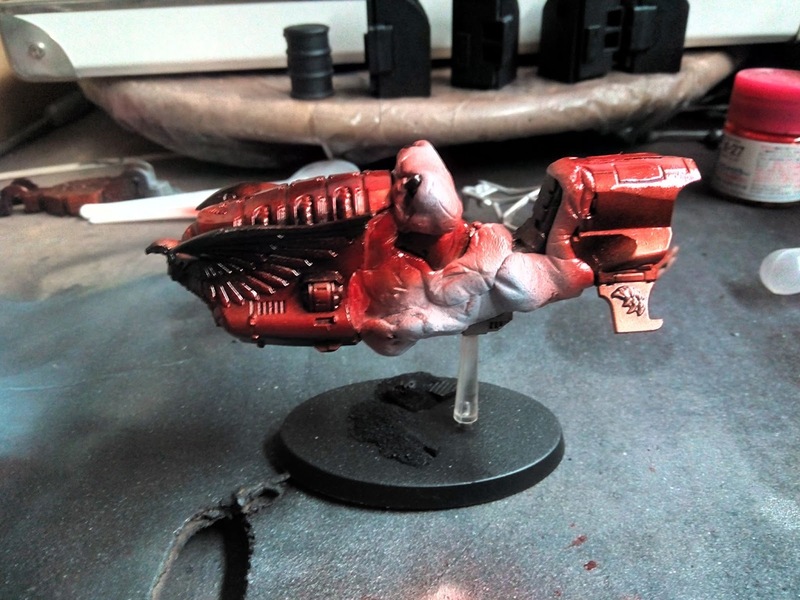 Maybe use some acrylic water effect over the top? 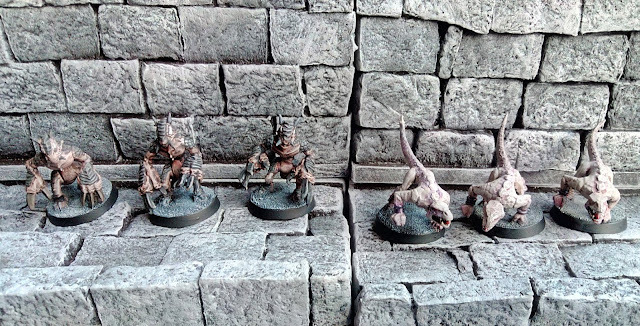 Or use a thick layer of gloss varnish from a spray can (and then matt varnish the ash edges of the pools and rusty stuff)? I'm still considering what will work best. What have I been up to, and what do I intend to be up to? Well, the past few weeks have been very busy, holidays, busiest time of year at work, and health worries about my mother, plus frustrations about not being able to get her the care she needs (and we need her to have) have kept my energy and time for the hobby low. Bases will be done at a later point, all at once. 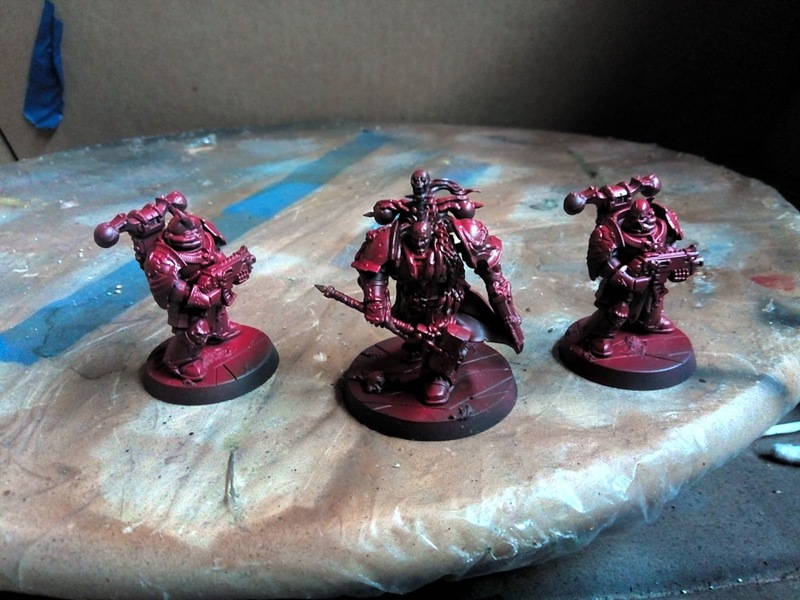 (In this foto I hadn't done the mottling on their backs, I'll do some glamour shots later, once more is finished). Doesn't means I've been sitting still on the terrain front, though. 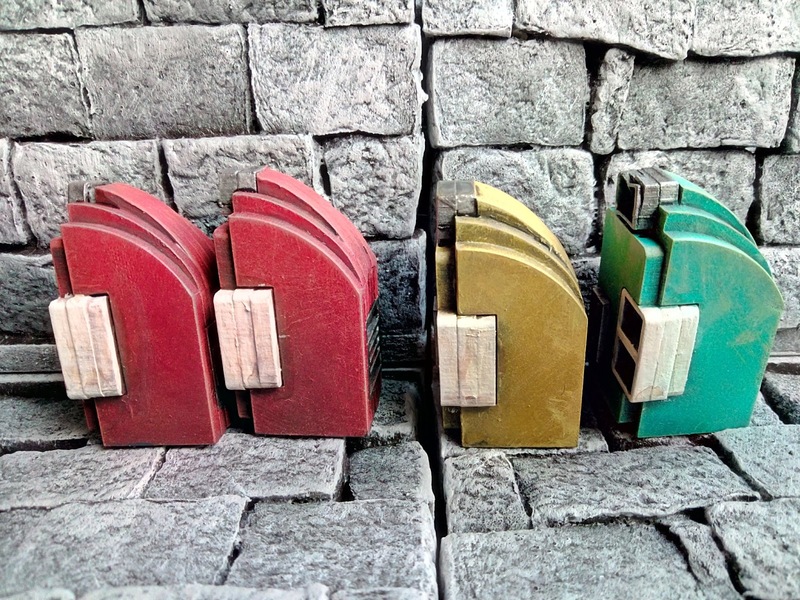 So, I can get started on building some containers/container shanties for Necromunda. As always, it'll work fine for 40K and Kill Team as well. Not the final head or shoulder pads. 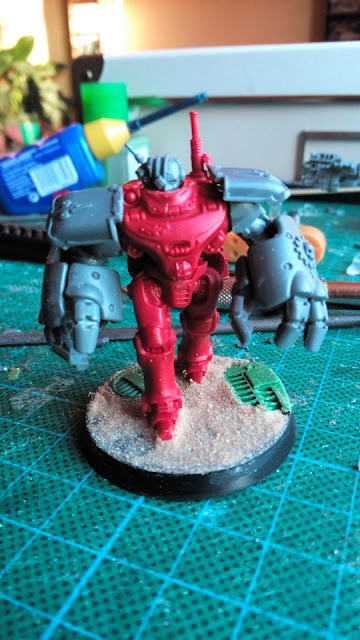 I may end up going with larger shoulder pads and a Ruststalker head instead. I just need to source the bits and see if I like it. It will most likely be an assault/labour servitor or a midget Ambot or some such. The sand-PVA mix on them is drying at the moment, hopefully paint and resin next week. 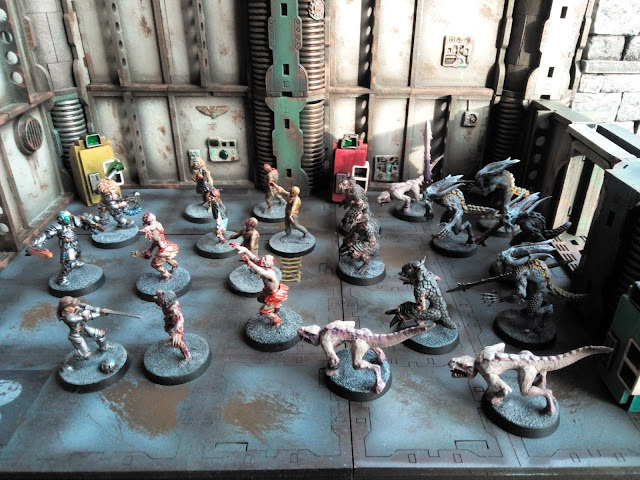 I've also taken the time to look back at what I painted last year, and I managed to get 47 figures painted, 2 scratch-built Necromunda terrain pieces, and one of my 4 sets of Multiverse Gaming Terrain. For me, that is a reasonably good year, these days. So, what are my plans for the coming year? 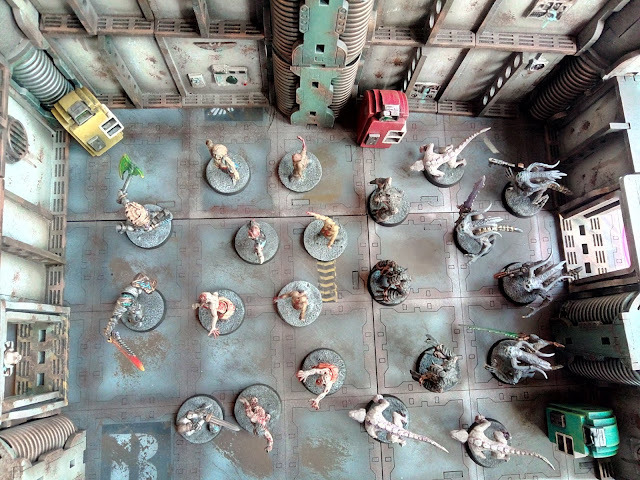 -Blackstone Fortress: I want to get all the mini's painted and start playing it. -Multiverse Gaming Terrain: I want to finish my set of Multiverse Gaming Terrain, so I have a decent set of Zone Mortalis (esque) terrain for Necromunda and Kill Team. However, me being me, some secondary projects have popped up. -Resin: I have a pot of resin now, and I intend to use it before it goes off. 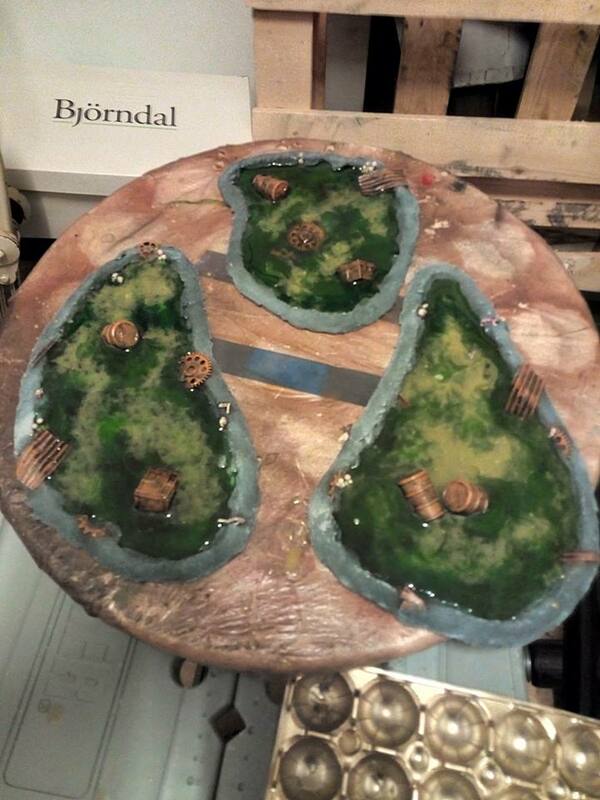 The Toxic Sump Pools above are just the trail project, to see how I should handle resin. After that there are various, still vague plans. 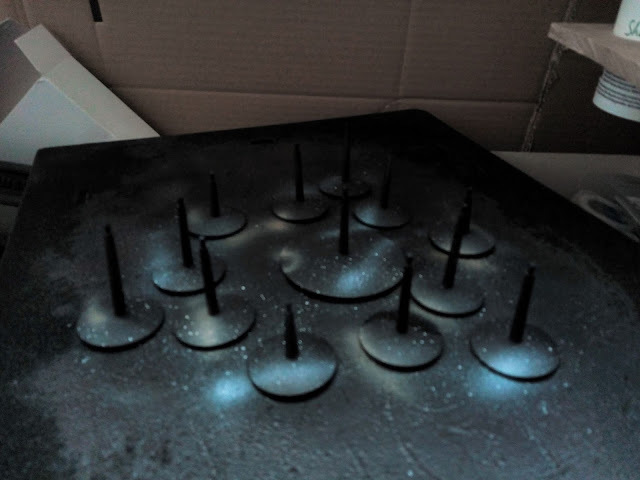 I hope to incorporate the resin in the Multiverse Gaming Terrain project as well, to use as leaks and the toxic pools shown on some Necromunda terrain boards. 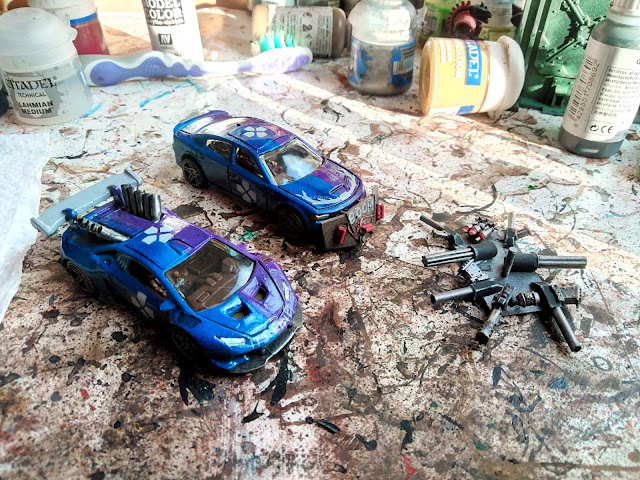 Both the above projects tie back in to a main project and will teach me new hobby skills so I'm okay with that, and the side projects were more or less planned. 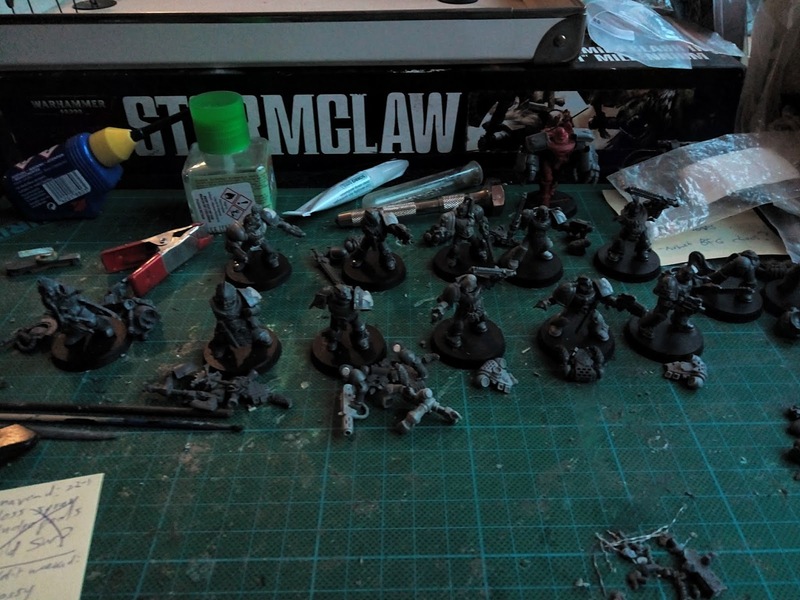 Less planned is the Space Wolf Army that seems to have spontaneously materialized... 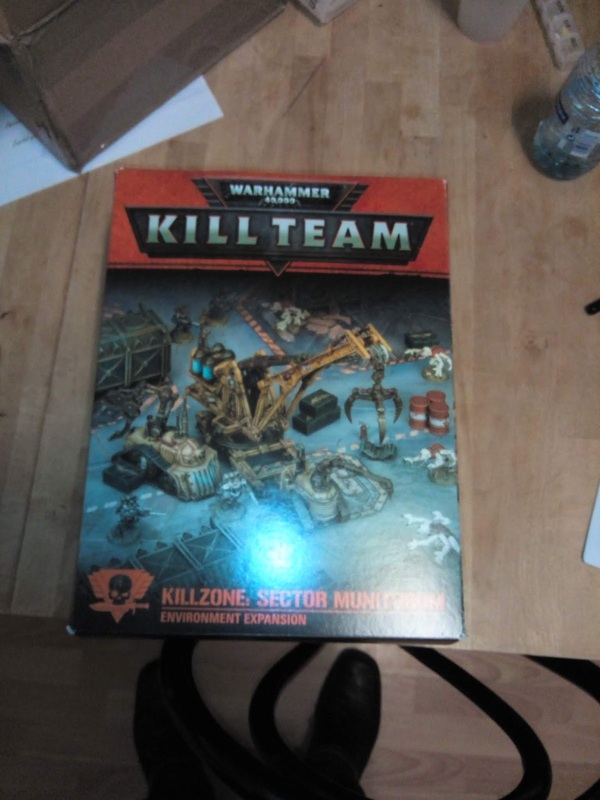 I bought the Stormclaw at the time for the Ork content, and to get Space Wolf Terminators for the Space Hulk project. 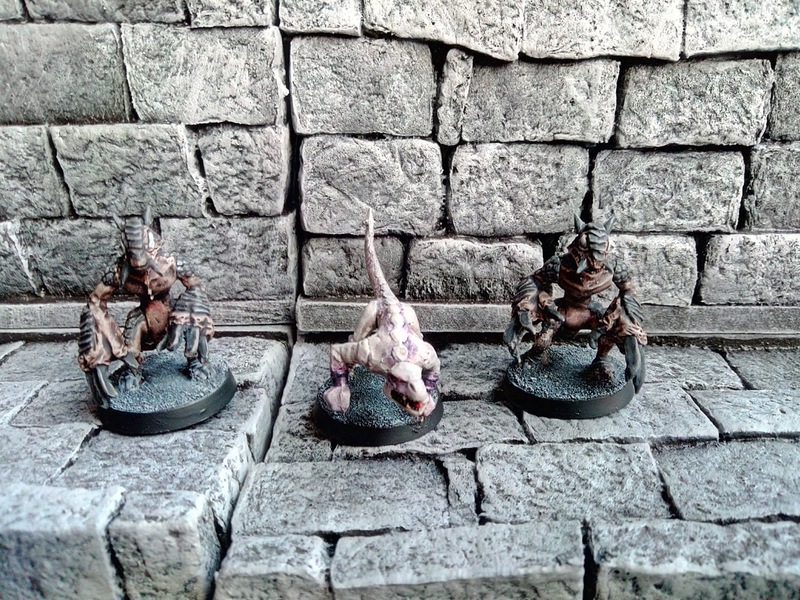 Now I ordered the Tooth and Claw set, to use the Genestealer Cult models for the Space Hulk Project/Necromunda/Kill Team project. 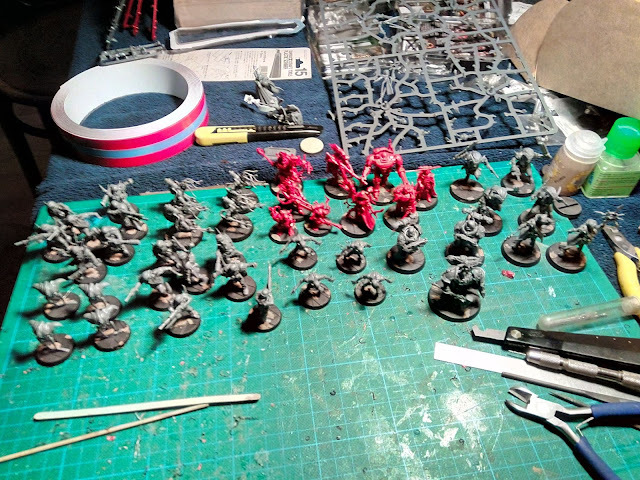 But now I'll have a Primaris contingent of Space Wolves as well... Plus the remaining metal Wolf Guard, Wolf Scouts and Characters I kept from an aborted earlier edition Space Wolf army... And an airbrush to paint all that grey quicker... And a clear idea for the colours to use from the Inquisitor scale Space Wolf I did last year. 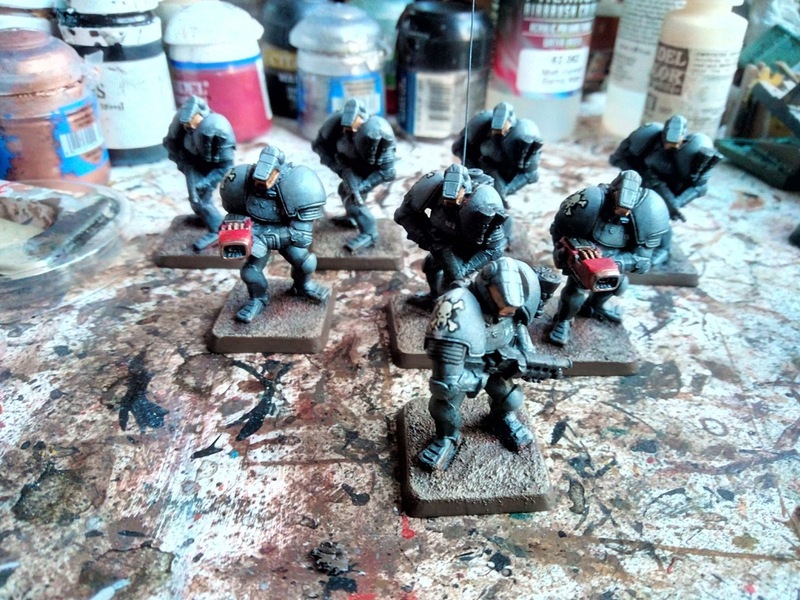 The snowball is rolling and growing, and I'm sure I can hear wolves in the distance... ;) It's not like I have a Howling Griffons army to build, or a Word Bearer one hiding in boxes for assembly... But on the other hands, it would mean some opposition for my Orks, so I could host games and maybe introduce my son to 40K. Eh, I have a whole year ahead of me, we'll see how it goes. 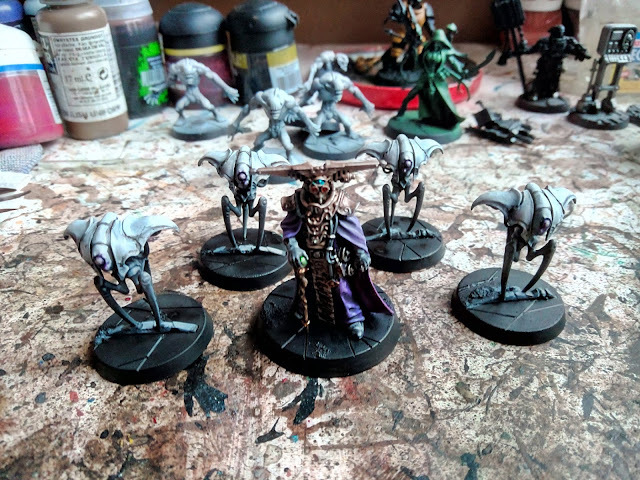 In theory I could play a game of Blackstone Fortress now. But I really want to try and paint them all before I do so... Luckily with an airbrush priming and basecoating (parts of the) mini's should go somewhat quickly. Been a few weeks, sorry for not updating in the meantime. 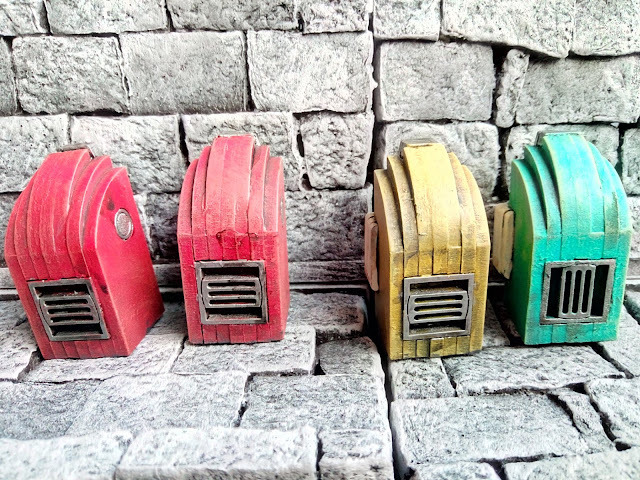 A certain project that I made as a gift for a pair of Youtubers I really like has been received by them and so now I can share it with you. 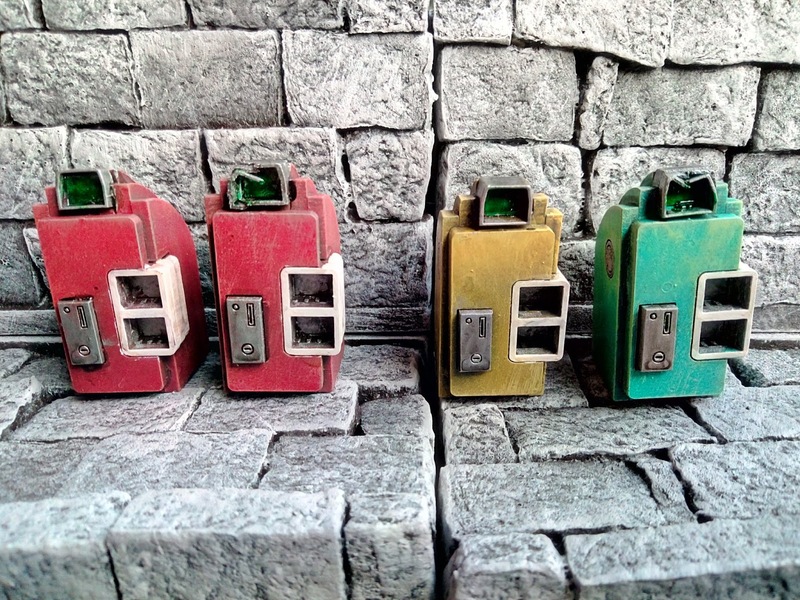 The Youtubers in question are Snipe and Wib and the gift was a set of custom Gaslands cars in the colours of their own Space Marine Chapter, the Cardinal Archivists. I found out for each what their favorite kind of car was in the game and built them one. As you can see, the roofs of the cars are covered in steel tape, allowing the guns to be attached with magnets. These are old "Legions of Steel" Earth troopers, given a quick basecoat and shade with the airbrush before handpainting the details. 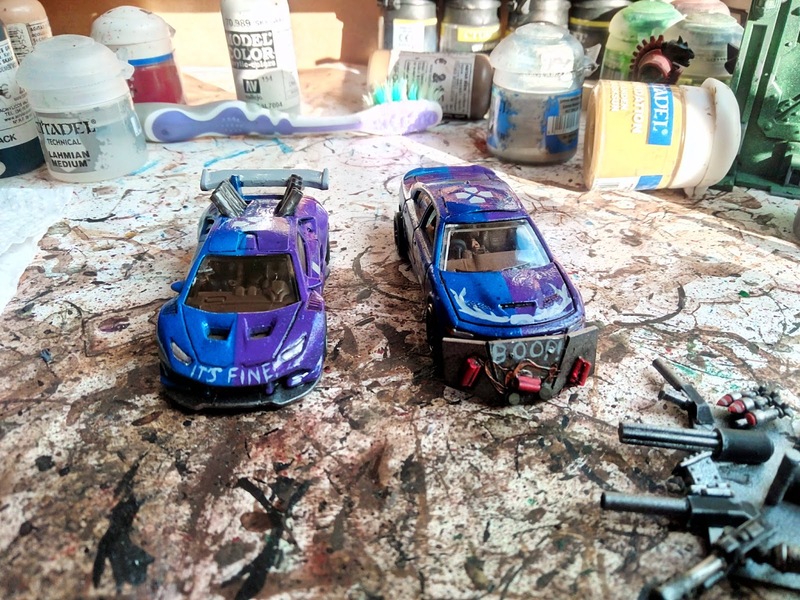 First time in years I've used decals as well. Just a quick job to get them out of the Cabinet of Shame (more like a Room of Shame!) and table ready for when Osprey's Cyberpunk rules come out sometime next year. 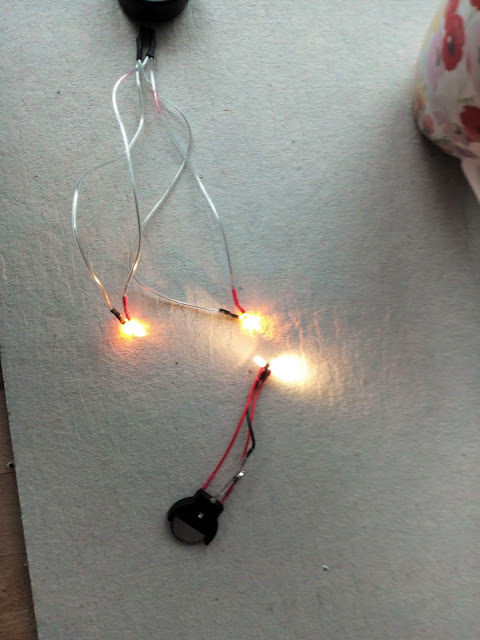 For one, I want to incorporate LEDs (see previous posts about the terrain), but I found I'm getting cold feet about trying something new that I don't totally feel comfortable with in such a large project. So I will have to find/build a quick terrain project to serve as a test bed and confidence builder. 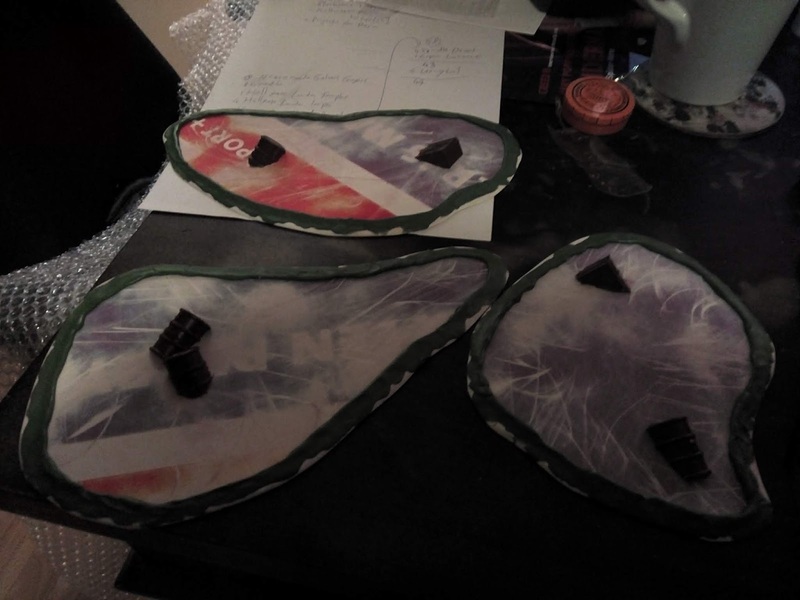 Second reason is that I've been losing the energy for large(r) hobby endeavours at the moment, due to some worry about my mother's deteriorating state of health, which means sitting idly by the sidelines as professionals essentially decide her fate. Most likely she'll need to go to a home for the elderly as she is no longer capable of taking care of herself, and no longer sound enough of mind to arrange her own affairs. Third reason, and one that has only "materialized" this week is Blackstone Fortress. My copy arrived last Thursday, and I've spent today looking at the contents of the box, leafing the books. 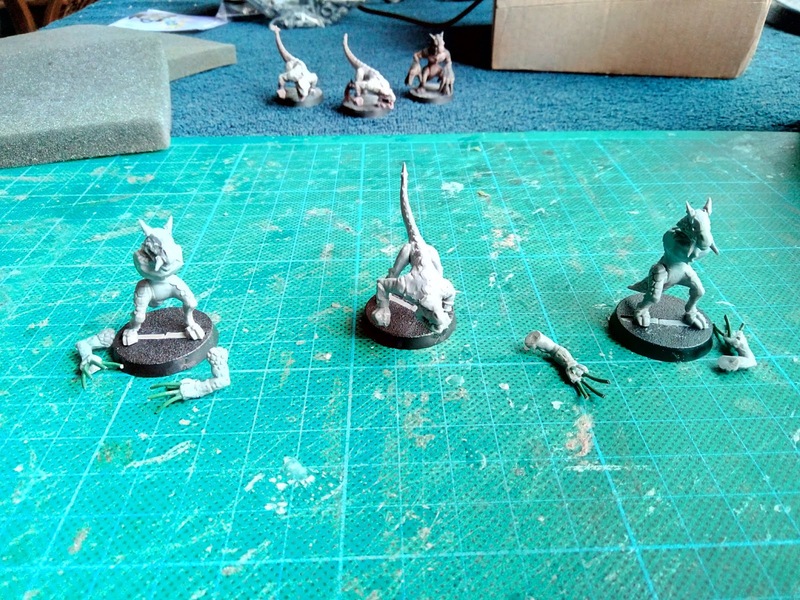 I've also made a start at assembling the miniatures. I assume this will be taking up my hobby time the coming weeks/months. I've always liked dungeoncrawler games, and to finally have one for 40K is quite exciting! The mini's are gorgeous, I hope the game is of similar quality as the plastics. Hopefully I'll have some worthwhile pictures for my next post.